During the early 1950s the mail sorting office in Brighton had 6 men for 8 hours a day sorting the thousands of postcards posted by the day trippers. I lived opposite the Windsor Castle at my parent’s restaurant – this was situated at number 15 and was called The Express Dining Rooms. We used to open at 5.30.am on Bank Holidays to serve the early arrivals on the excursion trains from the Midlands. Next door at the corner with Church Street was a shoe shop; Freeman Hardy and Willis. Number 14 was Girling’s cycle shop where I bought my first bike for 2/6d per week (30p today). Next to the pub was a bespoke tailor, then a pawnshop, and then the office of Durtnalls, removals and storage. On the high pavement was the doctor’s surgery – Dr. Frazer who was private, and Dr.Corr who looked after those who paid through a friendly society. Windstons’s the printers was a couple of doors up in the semi-basement where I could see the machine working through the window. My ancestors, The Youngs, had a bespoke boot and shoe business at 122 Queen’s Road (down a couple of buildings from The Windsor Castle) from about 1856 to the 1890’s. Unfortunately when I went to research this building I was saddened to see it had been demolished. If possible would Tony be willing to contact me if he has any information on the size and interiors of the houses on Queen’s Road? I would really appreciate any information. In 1962, my father took over the newsagent shop between the Eagle Star building and the Oddfellows Hall. These buildings have been demolished for new office buildings. The striking memory of that time was that Brighton was the range of foreign newspapers and international sport magazines as well as the shrink wrapped copies of Fanny Hill and the Kama Sutra. I remember most of the redevelopment that happened around West Street and Churchill Square as I explored and climbed over the demolition and building sites, avioding builders and security guards who were always too slow. I was a boy scout at St Peter’s church and remember the old abattoir that lies beneath the Churchill Square car parks. Any information or images of the Oddfellows Hall and the newsagent would be of interest. Does anyone remember the music shop, Hayllars, at Number 7? It was right by a bus stop. My father, Fred Neale, married Mary Hayllar some 40 odd years ago and worked in the shop with her for many years, repairing and re-dipping musical instruments. The inside of the shop instantly transported one back to olden times, with little wooden compartments and drawers to house all the little nicky-nacky-noo things required by musicians. It always reminded me of a scene from a Charles Dickens book. I believe that before it was a music shop Mary’s father and mother ran an electrical business from the same premises. Dad and Mary have long since retired and the shop was gutted and refitted. What a shame! Yes I remember the Music shop and HMStanley Jewellers (also in North Street) and Barrie Davis the Timex watch man, Clapshaw and Cleave the Sports Shop and on the second floor a Dickension Scene of a Jewellery Workshop where we would heat dishes of Potassium Cyanide solutions on a gas ring, two inches away from the ‘pickle’, an earthenware bowl filled with Acid. Yes, this combination of deadly gas chamber chemicals, were kept within inches of each other during heating and only six feet apart in use. The cyanide was used as a medium to transfer fine gold, from an anode to an article attached to the cathode and powered by a bell battery. This was the Gilding process. The acid was used as a medium to bleach the oxidisation of the soldering/melting process of the precious metals, prior to polishing and finally gilding. I at 15 years old and armed with nothing more than a hand written bill head from my employer, would go to Glaiyser & Kemp, wholesale chemists, I think Red Cross or White Cross Street, and walk out with a one pound jar of potassium cyanide, and carry it round the streets of Brighton and Hove all day as I visited the town’s jewellery and watchmaking outlets. What chance of that today? Who remembers the Continentale Patisserie, opposite Clapshaw and Cleave. It was run by an Austrian Lady, Mrs. Marcus and her husband ‘Bertie’, who was partially disabled. The Baker was George a lovely man and as well as Apple Strudel and Almond and Vanilla Slices to die for, they produced bread and rolls that were to live for. My Dad used to take us out on Sundays and walked us everywhere – even from Brighton to Rottingdean and we used to get the bus back. We often walked up Queens Road and looked in the window at the glass animals being made; we were enthralled. I know the shop is still there but I suppose the glass animals are a thing of the past. My grandad owned Johnsons Photographic shop in Queens Road. Does anyone remember it? Yes Patricia, I remember the music shop in Queens Road. Although small it was such a grand place. I believe my parents went there to order their musical scores of Gilbert and Sullivan. This was back as far as the 50s. Later I remember the excitement of Laura Ashley and the arrival of Biba. All things back then seemed to have a better value and more appreciation connected to them. Thanks for reminding us. Something else I just remembered. What about the glass man? He would sit in his window blowing glass for all to watch. His work was so delicate and fine. I remember buying a delightfull ‘Lily of the Valley’ to give to my aunt who was a painter and had given me one of her Lily of the Valley paintings some time previously. I live at number 7 Queens Road above the shop which is now a tattooist. I have often wondered what kind of life this great old building has had prior to me moving in. I heard that there used to be a bakers in the basement as there is still a stone oven down there. Does anyone have any stories or has ever been / lived above the shop? I would love to hear about your memories. I too remember Mr Axcell, The Glass Animal Man. He later moved to a kiosk on one of the piers. Can’t remember which one. I have a photo of him somewhere, if I can only find it. Does anyone remember Rocko’s just down from the station? They used to sell flick knives and all sorts of lethal weapons. They would’nt go down very well today – just the opposite. As a child of 8 or 9, Rocko’s was the most exciting shop in Brighton . All sorts of things that you knew were slightly risque but because of that you wanted them even more. I have fond memories of a flick knife that I had to keep hidden but spent many happy hours flicking it open and then shutting it again . I took over the hairdressing salon next to the Masonic Temple and just down from the glass animal man in 1967. I live in South Africa now but still have old photos of all sorts to look at and feel nostalgic! This is such a great site. When I was a teenager I worked at Hudson’s furniture depository in Queens Road right next to the station. I was a porter on furniture removals and also worked in the building which was also one of the depositories. There was also a furniture depository in Station Street. Both buildings were Victorian on the outside and very Victorian on the inside. There were lifts to take the furniture for storage on different floors. This lift was totally Victorian. It consisted of a platform roughly 20’x15′ (6 metres x just over 4.5 metres) (ish). We would unload the lorry full of furniture onto the platform. Then the porters would go one to every floor to pull on the rope that was around a pully in the roof so to lift the platform up to the required floor. One man operated the brake which also had a rope to control it, especially when it was on it’s way down. It was common to give the platform some wellie by pulling hard on the ropes when it was on the way down to see if the brakeman had his mind on the job. It wouldn’t have been the first time that the platform and the ground met at some speed, the brakeman cursing his (red faced) head off at the shame of not paying enough attention to the rapid descent of the platform. I must confess to doing a naughty while I was there. One of the drivers called Ralph (a lovely man) used to leave his Ford 10 in the yard when he was on a two day moving job. While he was away I would fiddle the ignition on the car with a hair pin and use his car every time I had the chance. I always put petrol in the tank and looked after it really well.The only thing I forgot was that the miles had gone up on the speedo and of course he noticed it. I came clean and I bought the car from him not too soon after. He bought a little Renault 4. I preferred the Ford any day. I had some good fun at that firm. I used to buy my knuckle dusters from Rocko’s being a rocker of course in the early 60s. I think if I had used them for hitting people they would have broken my hand. The glass animal man used to be down the steps by the aquarium where there is a cut through to the beach, in the late 50s. He then moved to Queens Rd and I used to take my little boy to see him. I still have the earings he made me. I wanted some Alsation dogs, he said come back in an hour and they were done. Does anyone recall a coffee bar on Queens Rd, it was very popular in the 60s, I can’t remember the name? My parents owned the Windsor Castle from 1961 to 1968. I remember the glass animal man very well. He used to come into the pub and made me a tiny stork and baby when I was expecting my first child, now 42. I too remember the coffee bar but not the name. Ann: the coffee shop was called the Milk Bar Limited. 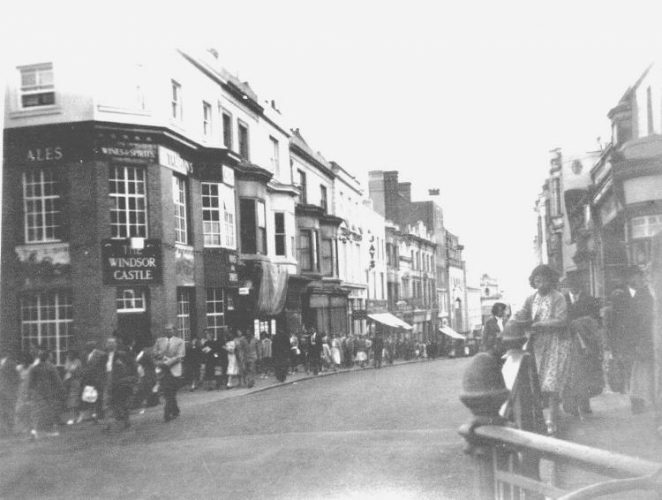 I used to live at 99 Queens Rd in the 60’s, above the antique furniture shop – this was on the left going towards the clock tower. I also remember Rocko’s and the Continentale Patisserie. I used to sell paraffin at the old garage that became the Casino near the station. We lived opposite this little half shop that was all to do with family planning and had a picture of Mum and Dad bathing the baby in the window. Does any one remember Skinners the hardware shop in little Surrey S,t and the dairy shop opposite the police box? Does anyone remember the Rendevous cafe on the right as you came out of the station just up from Rockos? It was owned in the early fifties by a Turkish Cypriot family and later was one of the first places to have a 45 record juke box. I well remember the Rendevous Cafe as I went to school with the eldest son. If I remember rightly his name was Mamet Rushet. I rememcer his parents were very strict, and everybody in the family unit had to pull their weight. I just saw that Anne Gee took over a hairdressers in Queens Road. I know my grandma ran a hotel next to the hairdresser but I can’t remember the name, something like Emily’s or Enries? If anyone has any memories or pics, I’d love to see them. Thanks. Emerys Hotel was on the right hand side going down from the station almost adjoining the Imperial Hotel. There is a picture of Emerys Hotel on the Regency James Gray website, number 177, in the Queens Road, Station area section. The Windsor Castle pub at 120 Queens Road later became the Cat and Cucumber cafe/snack bar. My parents owned it in the late 1970s. I recall the glass animal man coming in for his lunch. Several mentions of Rockos above (and suppressed sniggers from men of a certain age…blush, blush!). It was owned and run by the parents of the man who went on to found the Ben Sherman shirt empire in the 1960s (Arthur Benjamin Sugarman). Hi Liz, Edward James Reeves probably arrived in Brighton in the early 1850’s and by 1854 had a grocery shop on the corner of Edward Street and George Street (it had frontage and an address in each road). Two years later he also had another shop at 70, Southover Street. In 1867 his private address was at 9, Dorset Gardens. The move to Queen’s Road took place around 1880 and the premises covered numbers 85-7, with a further outlet at 1, Frederick Place. By the mid 1920’s the company were still based in Queen’s Road and were described as ‘Wholesale Provision Merchants, Grocers and Sugar Millers’. By the 1930’s, the company had merged to become ‘Reynolds, Reeves and Dickeson Ltd’. This company continued trading at the same premises until the mid 1950’s, after which time they were used by the A-Z Map company. Regards, Andy. I was born at 65 Queens Rd in 1945 (The Mitre Tavern, then!) – I more or less lived at Rocko’s, a paradise for kids & only a couple of doors away from us, loved going in there! I also remember the man that made glass animals etc.. could watch him for ages! In the ‘Main Season’ when the tourists spilled out of the Station, I also ‘helped’ the lady in the ‘Bible Shop’ to thrust leaflets into unsuspecting hands – the shop was filled to the ceiling with such pamphlets etc. Tommy Farr (the Boxer) had a restaurant on ‘our block’ & I went to his sons birthday party. Then there was Farleigh’s, a shell fish shop next door. I just loved growing up there – went to St. Paul’s School in West St. where my Mum & Nan had also been before me. Does anyone remember the Imperial Hotel Bar, Queens Road. I played accordion occasionally with the resident trio run by two brothers (can’t remember their name just now). Buster Brown was the drummer. This was circa 1954. I wonder if Barrie Searle or anyone else remembers or met a typewriter salesman Joseph Dunleavy who stayed at the Imperial Hotel on Queen’s Road in 1953-54 and the typewriter company W Gooding and Son a few doors away? Many thanks. Rockos was owned by the Sugarmans. Arthur Sugarman became Ben Sherman, yes, the chap who brought high tailored shirts to the UK! He had a shop on North Street as well as on Carnaby Street in London. Emery’s Hotel was owned and run by my grandparents and their sons (my mother being the only daughter). The premises adjoining the hotel was once the Caribbean Cafe later changed to Charlie Clark’s barbers. At least one of my uncles ran the Imperial Hotel adjoining. Later both were knocked down and developed into what is now BBC Radio Brighton. I lived at the Mitre Tavern from my birth in 1954 till I was two. My parents were Greta and Syd Hornbrook who were landlords there. However my connections went on for many years as my parents were lifelong friends with Gerry and Sally Jonas who owned Queens Cafe which was next door. We also kept in touch with Bill and Anne Farleigh who had the shellfish bar mentioned earlier. Walked down Queens Road from the station today – I have lived near Manchester for 30 years and the memories came flooding back! Reading this I too remember the glass man who must have been there for years and a man called Ben who ran a fruit shop a few doors from the Mitre. My parents were the owners of Farleigh’s fish bar from 1952-1960 approx. I remember once that we stood on our small balcony, and watched a bottle fight between a gang of teddy boys, and I think Cypriots; how awful that was. I went to The Sussex Drama School. I have a sister Raye who went to Varndean School. Our brother Billy died from a motorbike accident, aged 15. To Jo Burillo, I remember your parents fish bar very well, I was a close friend of Billy, being school friends at Dorothy Stringer. We spent many happy hours fishing, ice skating and playing football, (his photo is on the Dorothy Stringer section of this site) often we would end up above the fish bar with your mum making us drinks and sandwiches. I do remember often there were girls around, that would have been you or your sister. Although it was a long time ago I still remember the great times Bill and I spent together, I lost a very good friend. I lived at the Cat and the Cucumber during my formative years in the 70’s – my parents run the restaurant and we lived upstairs. I remember the huge basement where my brother and I often played – helping ourselves to crisps and fizzy drinks stored there. Also amazing birthday parties in the restaurant. The building was previously the Windsor Castle pub, and had a beautiful tiled picture on the outside. The building was later demolished and several years later I was visiting Brighton Museum and the tiled picture was on display. I remember a lovely cake shop down the road, the second hand book shop and the glass animal shop, where the man would sit in the windows making the animals.